Promotion Offers: FREE GIFT WORTH OVER £55! Subscribe to Your Dog Magazine for just £9.75 a quarter, saving £1 an issue! This gift bundle makes the perfect dog walking package and is worth well over £55. When you subscribe on this fantastic offer today you will receive this gift completely FREE. The minimal term is 12 months, after which your subscription will continue at the quarterly rate unless you cancel. Your free gift will be sent out within 28 days of receiving your first payment. Offer and free gift available to UK-only, for overseas prices please see below. Free gift available while stocks last. If we are out of stock on a particular item we will replace the item with a product of a similar value. Simply subscribe below, or call our friendly subscriptions team on 01778 395 177. 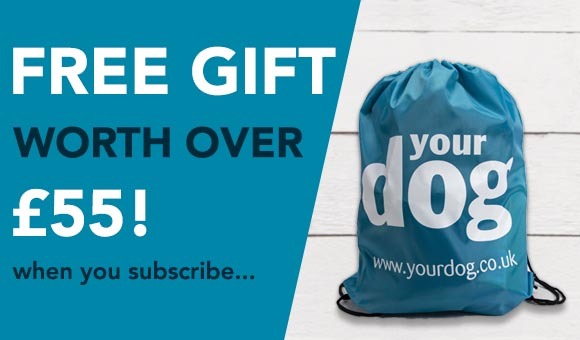 Subscribe to Your Dog for just £9.75 via quarterly Direct Debit with a free gift bundle. This offer is bundled with the following free gift(s). Free Gift Bundle : When you subscribe to Britain’s best-selling dog magazine, you’ll receive a FREE gift bundle — including an Ancol Quick Drying Dog Towel, Water Bowl, Ancol Clip-on Treat Bag, Ancol Poo Bag Dispenser, Dog Treats, Nylabone Chew Bone, Your Dog Drawstring Bag and a Orvis Personalised Collar — worth a total of £55!